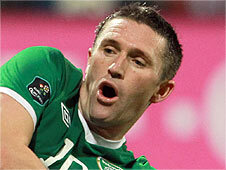 Republic of Ireland skipper Robbie Keane has no intention of quitting international football just yet. The 30-year-old will captain his country for the 40th time in Saturday's Euro 2012 qualifier with Macedonia - equalling Andy Townsend's record. Keane has clarified recent comments which suggested that his Republic days could be drawing to a close. "I will make it clear: I have no intention to retire at all. I want to play as long as I can," insisted Keane. Keane acknowledged on Friday that his recent fitness struggles could mean a relatively early substitution in Saturday's clash at the Aviva Stadium. The player's calf injury has restricted him to around 20 minutes of senior football for West Ham and a little more than an hour for the reserves since the beginning of last month. Keane caused something of a stir when, as he was unveiled by the Hammers following a January loan move from Tottenham, he admitted that he would happily move aside if a younger, fitter striker came through the ranks for the Irish. However, he was quick to clarify his comments on Friday as he prepared to win his 105th senior international cap. "I think you have seen over years, I have always been committed and always wanted to play for my country, and that will never change. "I don't like to predict what is going to happen in three or four years' time with injuries and what have you. "I will just take each campaign as it comes, look forward to this campaign and hope we can qualify. "I was just asked the question that if someone came in and the manager felt it was time for me to be pushed aside, I would be fairly happy." Keane is confident he is fit enough to play after returning to action a fortnight earlier than expected with the help of ice chamber treatments, which included a surprise meeting with former boxer Frank Bruno. "It's an ice chamber that myself and one of the lads went to, and Frank Bruno was there as well. "He was in there singing Danny Boy, which was a bit bizarre. "You do two sessions a day of nine minutes. You go in for four minutes, come back out, go on the bike for a few minutes and go back in again. "You don't want to be in any longer than that, trust me. But it was good, it's probably healed me a lot better."